Cae Ffynon Win is situated along the picturesque River Aeron, slotted nicely between Panteg Road and South Road Aberaeron, on a site formerly used as a garden centre and market garden. The Association was formed approximately eight years ago by six founder members and their families; six plots were created and duly fenced off for ‘rabbit protection’ – a somewhat unnecessary effort as it turned out, as, for some unfathomable reason, there do not appear to be any rabbits in our vicinity, and the fencing has since been removed. Because of the hard work and enterprise of these individuals, much interest was generated by outside parties in obtaining a plot for themselves. Additional land was acquired from Ceredigion County Council under licence, for the growing of fruit, vegetables and flowers; in all, we now have seventeen plots available for cultivation. Plots – We will have plots available for the 2019 growing season, please contact us, so that we can allocate. This year once again we took part in the Open Garden Scheme on Sunday, July the 29th. There were fresh surplus vegetables for sale, Teas and coffees. We had lots of visitors who enjoyed the teas cakes and chatting to the allotment holders. The surplus veg sold well, and lots of money was raised for good causes. Please see pictures in Gallery. I would like to begin by thanking all of you who attended the AGM in November. I am honoured to represent Aberaeron Allotment Asociation. I will always be wiling to listen and take on board any concerns that you might have. I know that one of the concerns is the water situation but we are contacting people and trying to get it sorted! We have a new treasurer (Dai Lewis) and a new secretary (Helen Watson) They do all the work! Together we make up the committee and on behalf of all members we would like to thank our previous chairman, Meurig Jones, for all that he has done over the last four years; cutting the grass, always helping people out in all sorts of ways and a big support in times of trouble. We are the only allotment organisation in the Aeron Valley and Aberaeron district, which actually has plots actively under cultivation. Please note that the association calling themselves Aeron Vale Allotment Society has no jurisdiction within our association, and, contrary to their advertising, do not hold possession or authority over any plots, at any location! 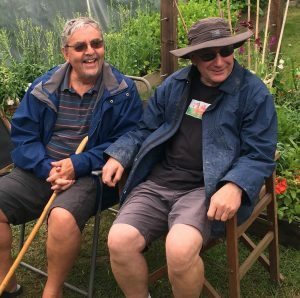 We would however be interested in hearing from anybody who has registered on their waiting list for an allotment; please contact us.